Are you bored of your Windows XP destop’s Start Menu? It is very plain but it does it’s job. But, if you are like me and have dozens and dozens of applications installed it can be a pain to locate the one you need quickly. If you have seen a Windows Vista desktop, you might have noticed the shiny new Start Menu in Vista. In fact, that is one of my favorite things about Vista. 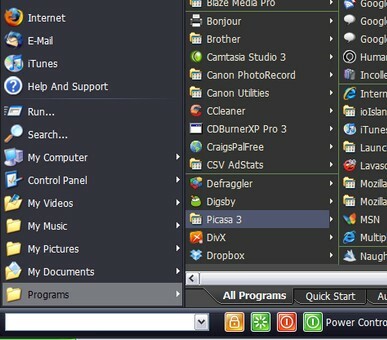 The Start Menu is more functional in Vista with the search feature that brings up apps/items as you type. Groups apps visually so you can easily identify the application you want quickly. Single Click access to programs – normally you will have to find the folder of the application and then navigate to the actual application to open. With VistaStartMenu, the folder icon gets replaced by the application icon (see picture) and you can just click on the folder to open the app. It is flexible enough to let you resize the menu, resize the font size, etc. The icons resize automatically depending on the menu size. If you use dual monitor, you can drag the menu to either monitors. Menu also sports tabs for QuickStart & Autorun. If you rely on keyboard shortcuts a lot, you are in luck here. You get a command line to start typing the app name and apps show up as you type. For powerusers, there is something called a QuickLaunch method that lets you navigate through the complete menu with keystrokes. This is very intuitive and you’d never need your mouse to navigate through this once you are used to it. VistaStartMenu comes as a FREE & PRO version. For most folks, the free version would suffice and has most of the features mentioned above. Menu customization – Lets you order items, add new ones, remove the ones you don’t like, add more tabs to the quick menu, etc. For those, who haven’t been able to adapt to application launcher programs like Humanized Enso, Launchy, RocketDock, etc., VistaStartMenu can be a refreshing change to their dull & boring XP Start Menu. If you try it, let me know how you liked it in the comments. Is a pretty neat trick. Ended up switching it back though, call me old-fashioned but I think I still like the old XP style better. but maybe i’ll wait until i can bump up my ram a bit. One reason I love Vista is the cool Start menu. If I was still on XP, I’d definitely give this app a try. I’m with John here, I tried it but then went back to the old XP as I felt more comfortable with it. Yes, I know I sound pathetic, but it just didn’t feel right somehow. Hey-ho. Oh God, I so needed this, I have dozens of apps and I can never find anything quickly, thanks so much! I just tried the free version and I gotta say am loving it! Its a nice change from the default xp theme. I have vista on my laptop but much prefer xp. Saying that though the start menu is probably the only feature I would consider keeping if i did move back to xp. Fahad, glad you are loving it! its quite good looking, but i agree with cat, usually it takes more resources isn’t it? Interestingly for me the number one reason I don’t like Vista is it’s Start Menu, whenever I use it I feel trapped. The only useful feature of the Vista Start menu is the search ability, otherwise it’s horrible.